Richard Wolf first tried Zen meditation in his teens, but no matter in what posture or for how long he sat, transcendence proved stubbornly out of reach. It was only years later that he found the bridge that could take him there: music. 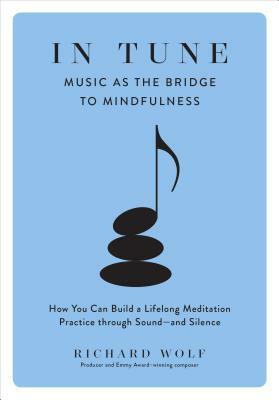 This inspirational guide offers a wealth of music-based exercises to enhance daily meditation and creativity. Plus, Wolf shares personal anecdotes of eminent musicians—from Miles Davis to Dr. Dre—to illuminate points along the intersection of music and mindful living. As you begin to move fluidly between these two transformative disciplines, you’ll notice the focus, composure, and peacefulness that comes from practice—as well as the joys of tuning in to the music all around you, and to the symphony that plays silently from within. Richard Wolf is an Emmy Award–winning composer, multi-platinum-selling music producer, and professor at the University of Southern California’s Thornton School of Music, where he teaches classes on music and mindfulness. As a producer/remixer/songwriter/composer, Wolf worked on projects with Prince, Bell Biv DeVoe, Freddie Mercury, Seal, MC Lyte, and Coolio, and has been contributing to the soundtracks for scores of films and television programs including twelve seasons of the worldwide hit NCIS. He started practicing Zen meditation when he was a teenager.